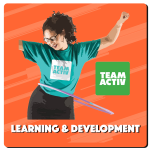 Staff development with Team Activ increases productivity, involves bespoke events & programmes for groups and teams to develop specific skills and attributes, promoting personal and business growth, learning & development. Designed around your company values and wellbeing priorities. Activities include: questioning skills, problem solving, maximising & releasing potential, innovative & entrepreneurship, idea sharing, coaching, mentoring, talent development and developing successful habits. Develop your organisation’s ‘learning culture’ to enhance motivation, increase staff retention & loyalty, develop sound working practices aligned to organisational goals, foster understanding & appreciation of other perspectives and reduce absenteeism.